Valenzuela City is one of the 16 cities that make up ‘Metro Manila’, or the National Capital Region. Of the 144 cities in the Philippines, Valenzuela City is the 13th most populous, with approximately 570,000 inhabitants. Located 14 km north of Manila, it is a highly urbanised and affluent industrial and residential suburb situated in a low-lying area and bordered by three interconnecting rivers: the Tullahan, the Polo and the Meycauayan. The confluence of these rivers makes Valenzuela vulnerable to flooding during high tides and also to flash floods, which occur regularly during the rainy season. During periods of heavy rainfall and high tides, stagnant water from floods can sometimes stay in the area for up to 4 weeks due to insufficient drainage, improper solid waste disposal and simply too much water. People are often stranded inside their homes with limited food and water supply, and are exposed to water-borne diseases such as dengue and leptospirosis, as well as coughs and colds. Businesses and entrepeneurs, such as street vendors, furniture makers, small-scale autorepair shops and fish-food processors must watch as the means of their livelihoods are submerged under water. 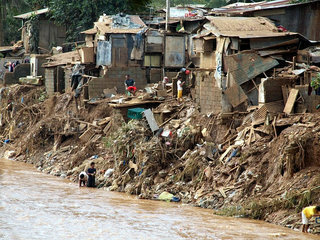 Office workers can also suffer from a lack of income if they are unable to go to work due to flooding. Because of the impacts of frequent flooding, Valenzuela City was chosen in 2011 as one of five project areas under the Philippines component of the Partners for Resilience (PfR) programme. PfR is a collaboration of five Netherlands-based organisations, along with 30 civil society partners in the global South. By integrating climate change adaptation and ecosystem management and restoration into disaster risk reduction, the programme aims to build resilient communities. Partnerships and networking play key roles in building resilience by helping to sustain programmes and facilitate learning exchanges among stakeholders, thus providing room for improvement and innovation. Climate- and ecosystem-smart disaster risk reduction approaches are feasible at the city level, but integrating them into development plans requires time and resources, as well as solid commitment from local chief executives and community members. Existing institutional mechanisms such as national laws and local ordinances can help push the resilience agenda forward. Integrating climate science and information along different timescales in different disaster risk reduction approaches is an effective entry point to urban resilience. However, local governments should not look at the concepts of climate change adaptation, ecosystem management and restoration, and disaster risk reduction in isolation but consider them systematically and plan holistic interventions. Read the full inside story here.